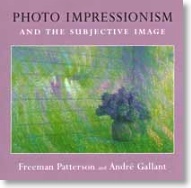 Now Shipping, PHOTO IMPRESSIONISM AND THE SUBJECTIVE IMAGE is a new instructional book on photography co-authored by Freeman Patterson and André Gallant. Topics covered in the new book include: multiple exposures, montages, subtle and vibrant colours, familiar techniques, trends, the intimate Earthscape, photographing around home, photographing abroad, photographing people, and a conclusion entitled "The Craft and Art of Photography. The great tradition of still photography is documentation, the representation of objective reality. The photographer observes a scene, situation, or object and responds to it by endeavouring to show it as it appears. The average person on vacation, the parent who is photographing his or her family, and probably a large majority of serious amateurs and professionals operate mainly within this tradition. However, there is a second tradition, that of altering physical reality for the purpose of expressing the photographer's personal response to specific subject matter or to a concept or idea." "Referring to the two traditions is rather like speaking about left-brain and right-brain photography, although this is an oversimplification, as many photographers work within both traditions and may produce deeply expressive realistic images as well as non-literal or non-realistic ones. Certainly the realistic visual documents of Margaret Bourke-White revealed the human condition in a way that stirred viewers deeply; Ansel Adams "intensified" the physical realities of nature, primarily through his printing, to make them appear even more real, and the nature images of Frans Lanting both rivet our attention and stimulate strong emotional response. However, the "impressionist" photographer deliberately abandons physical exactitude in the belief that he or she can convey the reality of feeling more effectively by doing so. Virtually nobody is an impressionist all of the time, but more and more photographers are becoming one part of the time, because they experience a degree of frustration if they confine their efforts only to recording what they see when they want to convey what they feel. This book is intended to help photographers venture into some aspects of the non-literal world of photography and to create (or, for that matter, to record) impressions that convey a truth of feeling or spirit."